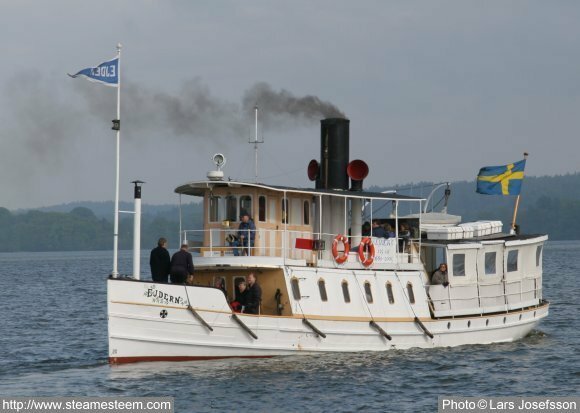 She sailed in the archipelago of Gothenburg from 1880 to 1897 and from 1898 to 1905 on the lake Roxen. Finally she sails in the waters of Södertälje since 1906. In 1964 she was rescued from being scuttled and nowadays the museum society "Ångfartyget Ejdern" owns and runs her. Do Spend a summer day on the lake Mälaren. A voyage aboard the steamship Ejdern will take you from Södertälje to the Drottningholm, Birka and Adelsö. 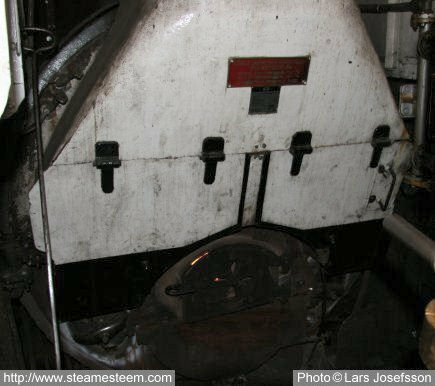 The coal fired Scotch Marine Boiler's front with its furnace. At the rim of the furnace door one can see that the steamship boiler is firing. The Steamship Ejdernmaneuvering place is very narrow. The high pressure piston's slide-valve rod and the quadrants for the Stephenson's link-motionare partly visible on the picture. 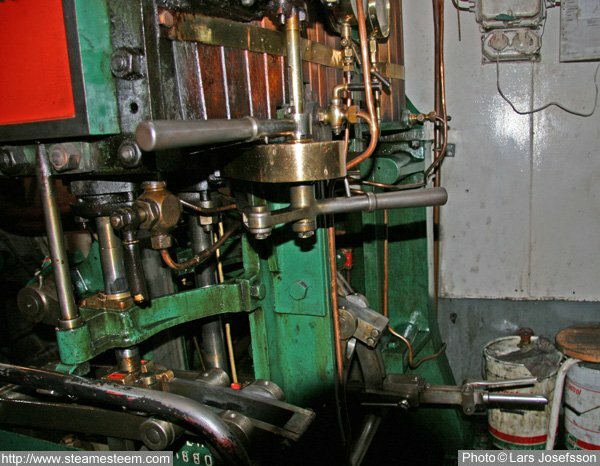 The Steamship Ejdern compound steam engine. The low-pressure cylinder to the left with a cylinder-oilcan on top of it. Note that the steam-pipe is red painted in accordance with the old colour code.